As a matter of habit, after reading the sports section of The Los Angeles Times, I casually thumb through the other features of the daily newspaper. One of the features is the obituary section found in the LatExtra section of the paper. This past Thursday, my eye caught one of the longest obits ever printed. One that covered the entire column from top to bottom. I casually read down the column, not giving the name at the top much attention. When I got down to the fifth paragraph, I noticed that the the deceased resided at the “Gak House” or Gakusei Kai, the student housing facility for those attending ending USC. This immediately made me go back to the name at the top because back in 1948, I lived at the “Gak House” along with 12 others. 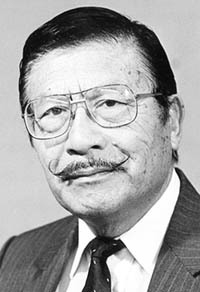 I saw the name of Elmer Yoshino and immediately recognized it. I checked through my files and came across a photo taken of the “Gak House” members, and sure enough, there was Elmer. He is standing in the back row, far left. That’s me third from left, back row. I guess the irony of all this is that although I lived at the “Gak House,” I was not a student at SC, the only member of the student housing who wasn’t enrolled there. I had applied for admission to SC but was turned down because I didn’t meet all the admission requirements. So when the manager of the “Gak House” learned that I would not be a student at SC, he told me I could live out the semester at the college but would have to move after that. I decided to move right away instead of loitering around for another few months. Looking around Little Tokyo, I found a small, cheap apartment a few blocks from J-Town and moved. Naturally, without a job, I started out with the group of guys who were labeled as “Taul Building Leaners.” All of them were in the same boat as me. That is, jobless individuals. Well, after a few months, someone told me that The Shin Nichi Bei, one of the three daily Japanese/English vernacular newspapers in J-Town, was looking for a sports writer, so I decided to throw in my application. Publisher Sab Kido interviewed me and introduced me to the editor, Mas Imon, who said if I could learn how to operate the linotype machine, he would hire me. The linotype machine was the device that set type for printing. So I spent a lot of hours learning how to operate the machine and finally got the hang of it. Being a linotype operator and a sports writer was quite a chore, but somehow I managed to live through it. After a year and a half of employment, another newspaper up the street, The Kashu Mainichi, decided to expand and started looking for employees. 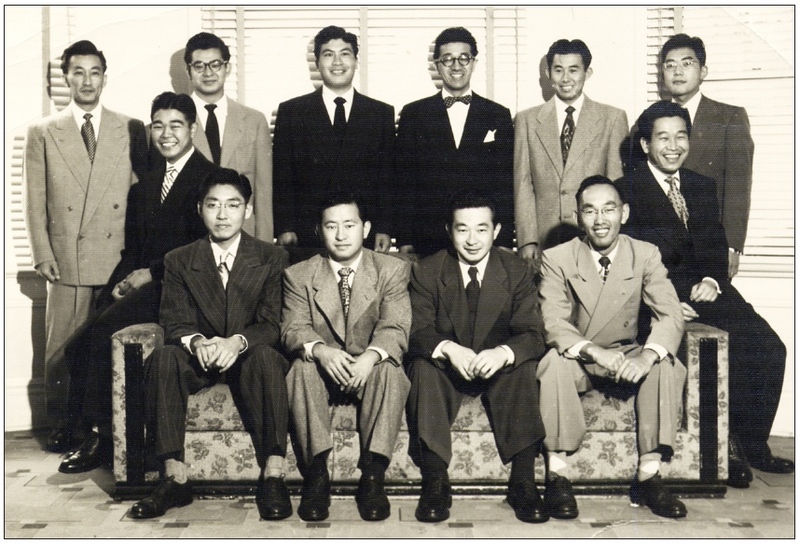 When publisher Hiro Hishiki heard of my being able to operate a linotype machine in addition to covering sports, he made me an offer of a job. After thinking about it, I decided to make the move and for the next 35 years, I worked for Kashu. Well, getting on in age, Hiro decided to sell The Kashu. The new owners said they were moving the publication to Glendale. That’s when I decided to retire. Driving from Gardena to Little Tokyo was too much for me and extending the daily trip to Glendale was even worse. So, I wrote my final column, “The Horse’s Mouth” in which I said I was “hanging up” my career. Then I got a call from Naomi Hirahara, then Engilsh editor of The Rafu, and I guess you can say what happened next is now history. All this was written because I happened to read the obit of an old friend. “Mr. Yoshinaga, my wife Agnes and I recently returned from a visit to Hiroshima. We met Mr. Toshikuni Nakagawa, the director of the Hiroshima Municipal Archives, and he asked us to make some inquiries on his behalf regarding the Japanese Americans who raised money and sent goods to Hiroshima in the years directly after the war. “He would like to include this story in a book that his organization is creating to commemorate the 70th anniversary of the city after the atomic bomb. “He is planning to visit L.A. in the summer and would like to speak to anyone who has any knowledge of what happened (such as) who organized the drive. “He’s looking for publicity to see if anyone in the Japanese community has information. We realized that many of the people who participated have since passed away, but perhaps their children know something. People in their 90s may also remember. Would The Rafu Shimpo be able to help? If so, whom should I speak with? “Thank you in advance for any assistance you can provide. Well, I hope the foregoing will inspire someone in readerland to respond to your letter, Richard. I’m sure someone will. Well, as I frequently mention, I have three sons. Yes, I had four but last year, I lost one of them and he was only 52 years in age. The reason I am mentioning this is that a number of readers wrote to me to inquire what my sons think of my writing. I’m sure most of you won’t believe this, but none of my sons read my column. I know every once in a while, one of them will tell me that because their last name is Yoshinaga, someone will ask, “Are you related to that writer for The Rafu?” At least that is what they tell me. So, how do they respond to the question? They will acknowledge, “Yeah, he’s my father,” but won’t go any further than that. “I just started reading your column. I just got in line for old issues of The Rafu. I’m reading three or four months of old papers. “I see that you are looking for a ride to Las Vegas when the urge hits you. I’m a Vegas guy who likes to hit the tables too. I’m a widowed senior citizen who does his own driving. I’ve been going with my widowed sister. I live in Gardena. Thanks, Kei. You may be hearing from me because next week it will be five months since my last Vegas trip. It’s the longest I’ve been away from Vegas ever. Since you made me the offer, I will plan a trip soon. “Over the past few columns you mentioned the name of the current Japanese consul general but you never printed his first name. Why is that? Maybe you didn’t hear what is his first name. Thanks for the info. I can now use “Jun” when and if I mention Consul General Niimi in future columns. Time out for a little giggle. As I frequently mention, we have three cats living with us. Two of the three are strays that somehow wandered onto our property and my wife decided to take them in. Well, I just showed her the results of a survey on how much pets cost their owners. According to the American Pet Products Association, in 2013 a dog owner shelled out $1,559 to feed and care for their pal and a cat owner paid $1,271, and it’s estimated that those costs will go up in 2014. Maybe I’ll catch my wife loading them in the car and driving off down the street. Would you believe I’ve been to the track only once in the last eight months and that once was the Santa Anita Reunion a few weeks ago? Yeah, it’s old age. Horse racing doesn’t excite me like it used to. Maybe before Santa Anita closes its season, I’ll make it out once more. I don’t recall reading the following in any edition of The Rafu, so I thought the information contained would be of interest to the readers. Hope you’ll be able to attend the program described in the press release here. “Power of the Commission Hearings: First-Person Voices of Japanese American Incarceration,” sponsored by the Japanese American Historical Society of Southern California, Nikkei for Civil Rights & Redress, Visual Communication, and the Torrance Public Library, will be held on Saturday, May 3, 1 to 3 p.m. at the Katy Geissert Civic Center Library, 3301 Torrance Blvd., Torrance, in the Community Meeting Room. In 1981, Japanese Americans spoke out for redress at the Commission on Wartime Relocation and Internment of Civilians hearings across the country. The Los Angeles hearing was one of the few that was videotaped. Preserved by the Nikkei for Civil Rights & Redress and Visual Communications, these testimonies galvanized a grassroots campaign for redress, resulting in the signing of the Civil Liberties Act of 1988, authorizing $20,000 and an apology. Panelists from both NCRR and testifiers from the South By will share insights from the hearings and the impact it had on their lives and he community. Excerpts from the hearings will be shown with special attention to South Bay testimonies. Among the testifiers from the South Bay to be shown on the video are Alice Nehira, Kumiko Sato, Yayoi Ono, Mas Tanibana, Warren Furutani and Mas Fukai. “We would like to encourage any other people who testified at the hearing to come to the program and share their experiences during the question and answering,” the committee said. Lane Hirabayashi, Ph.D., of the UCLA Asian American Studies Department will moderate the program with panelists Aiko Herzig Yoshinaga, Miya Iwataki, Kay Ochi, Charlie Hamasaki and Roy Nakano. Opening the program will be an eight-minute video segment of the L.A. hearings that will act as an overview. “Closing the program will be a clip of Professor Yuji Ichioka’s testimony, which is very powerful and acts as a great summation of what the hearings represented for Japanese Americans,” stated Steve Nagano, who has excerpted the video testimonies for the event. Copies of “Speaking Out For Justice” by Aiko Herzig Yoshinaga and Marjorie Lee of UCLA, which catalogs all the testimonies, will be available for sale. The program is free and open to the public.